LONDON, 2015-4-15 — /Travel PR News/ — easyJet, Europe’s leading airline, is today launching a new and innovative update to its award-winning app which is designed to provide helpful and timely guidance, directions and essential travel updates to passengers travelling from Gatwick Airport. Initially the service will launch on iPhones for passengers travelling to and from London Gatwick Airport, easyJet’s biggest base. The feature is available in seven languages and will significantly enhance the overall passenger experience every time they fly with easyJet. “Our goal is to provide industry-leading customer experiences while flying with easyJet and our new Mobile Host service is yet another example of how we use innovative, mobile technology to make travel easier for our passengers. In recent years easyJet has embraced technology to help make passenger journeys easier and more seamless. easyJet’s app is the fastest airline app available and has now been downloaded more than 12 million times. Almost 100,000 passengers used mobile boarding passes last week. easyJet flies on more of Europe’s most popular routes than any other airline. easyJet carries over 65 million passengers annually, of which more than 12 million are travelling on business. easyJet flies over 220 aircraft on more than 750 routes to over 130 airports across 33 countries. 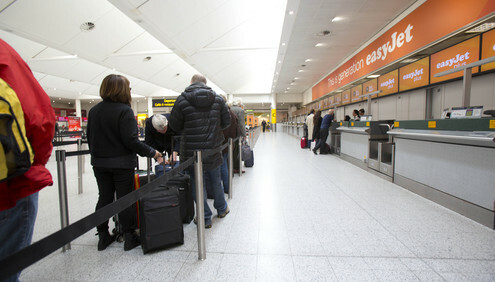 More than 300 million Europeans live within one hour’s drive of an easyJet airport. with UNICEF which has raised over £4m for the most vulnerable children since it was established in 2012. This entry was posted in Airlines, Airports, Flights, Transportation, Travel, Travel Apps, Travel Management, Travel Marketing, Travel Services, Travelers and tagged app, easyJet, James Millett, Michael Ibbitson, Mobile Host. Bookmark the permalink.